Eight "key moves" have been identified to continue the regeneration of Rotherham town centre. A masterplan has been refreshed by consultants, ARUP, setting the strategy for investment in key central sites that allows the Council to examine progress made, and prepare a new Supplementary Planning Document which will underpin future development for the town centre. The first key move is the development of a leisure hub on Forge Island, the former home of a Tesco supermarket that is currently being used as a temporary car park. Details of the proposals, anchored by a multiplex cinema, are detailed on Rothbiz here. The second key move is to continue with the encouragement of further residential development in the town centre to add "around the clock vitality and vibrancy." Sites where further residential development could take place include Westgate Chambers, the Law Courts and Police Station, alongside leisure uses on Forge Island, and along the river on Westgate and Sheffield Road. The masterplan states that residential development "will support the goals of the Masterplan, fulfilling the vision of re-populating the Town Centre to create a more vibrant, sustainable and family-friendly core for Rotherham." Another key move is to support "Making and Trading" in the town centre with the indoor market being retained and the remainder of the site being redeveloped. Influenced by Rotherham's history and ideas such as the Advanced Manufacturing Innovation District, a redeveloped market site could include opportunities for small scale manufacturing and space for entrepreneurs. The plans state: "The suitability of the Markets for this purpose is also reinforced by the fact that it would also be capable of providing a space in which products manufactured on site could be sold." The redevelopment of the Transport Interchange is also considered a key move. Issues over safety, fear of crime and CSE are often raised regarding the bus station and the car park above is "nearing the point of being beyond economic repair." The future of other key sites are also highlighted in the masterplan. These include the former Guest & Chrimes foundry adjacent to Rotherham United's New York Stadium where a mixed-used scheme to support the "making and trading" vision could see flexible workspaces and live/work space. Drummond Street Car Park adjacent to the new £40m Tesco is anticipated to be redeveloped to support the nearby reconfigured Markets by providing space for retail and making and trading. An Education Quarter, which includes the revamped campus for Rotherham College and proposals for a University Campus on Doncaster Gate, is seen as "vital to the future success of the town centre." 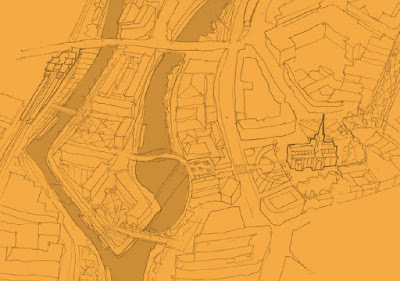 The remaining key moves in the masterplan cover public realm and access improvements - pedestrian "Gold Routes" through the town, improved gateways to create a strong sense of arrival and identity, and a "Green Network" to connect to surrounding greenspace. Making best use of the river and opening up the riverside continues to be key to the vision for Rotherham town centre. The draft plan is set to lead to consultation on a draft Supplementary Planning Document that would give weight in determining future planning decisions. Self-confident yet outward looking, Rotherham will build on its heritage as a market town and industrial powerhouse, becoming a bustling hub for living, learning, working, making and trading. Attracted by quality design and a strong sense of place, new Town Centre residents and visitors will benefit from an excellent cultural and leisure offer and an active night time economy. The Town Centre will become a truly family friendly destination with a vibrant community that will sustain the success of the town's independent retailers and market traders. Nurtured by a strong higher education campus, Rotherham’s entrepreneurial spirit will engender business start-ups. Located in the Town Centre, they will create new jobs and opportunities for the town's residents as they succeed and grow. With continual momentum and focus, the Town Centre will reclaim its place as the heart of the Borough. I probably won't live to see this regeneration happen but I like the idea of an entertainment complex and places to relax along the river. I also believe local traders living within the borough should be encouraged with low rents to set up businesses here to once again give the area that market town feel. A recent visit I had to Lincoln was an eye opener.. it was a pleasure walking in and out of developments along the river bank.. Maybe a little different to the Don; and because our leadership fail to broadcast what historical places we have close by, they do get more tourist traffic. But Lincoln general population has had to endure similar hardships as we have in Rotherham. I strongly disagree that on any part of the riverbank should be made "just" residential, like they have on the old baths sight. If the regeneration plans work that should be for us all to enjoy, because we had to endure it when it was a stinking polluted mess. The local people of Rotherham are hard working and need to see something is being done then I'm sure most (not all) of the doubters will rally. Another key fact to restore moral and trust in our multicultural society would be to discourage certain European government guests from coming to town and maybe redirected to Westminster so they could rub shoulders with each other. Like I say its highly unlikely I'll witness any improvements in the town I've lived in since birth but I wish you luck and hope the pride and confidence we once had Returns. The plans sound great - my only concern is that if the 'temporary' car park on Forge Island and the Drummond Street car park are both decommissioned as part of this, where are the visitor we hope to attract going to park? Having safe, good quality (I.e. tarmaced and maintained) and reasonably priced parking is an essential and should be factored in. Excellent news! I concur with the previous two comments especially the parking which is ultimately what makes people think twice about coming in to the centre - can they park in the centre easily? If so, at what cost? Leisure hub with cinema complex - well overdue - we are missing a trick without this component in the town centre. Similarly I probably will not be around to see all this materialise. Lets hope the cinema will be Cineworld. indoor market to be retained.what will happen to the outdoor covered market.i know of at least five traders who are second or third generation traders.how many traders in the indoor market can say that? not that many I bet.yes the covered market does need a massive clean up or even better refurbishment badly having said that just refurbishment is not the answer just look at Doncaster.